Slough Feg. The Lord Weird Slough Feg. Funny name nevertheless means serious business. Guilty as charged, I have not been following this talented, both traditional and extravagant band from their very start. But ever since I have reviewed Traveller a few years ago I have been on the lookout for more of Slough Feg original, but deeply rooted in the 80s brand of metal. As I said, I am not familiar with all of the band’s creations, but Atavism could very well be the apex of their career so far. When given a choice in dating, many of us would prefer to take out the prettiest girl in the class at the beginning. When it comes to settling down, you want an honest partner you can trust the rest of your life with, looks being a secondary issue. Slough Feg is that not pretty, but down to earth and honest band you can trust when you are out exploring Metal’s history. Never a commercial entity, never an overproduced record, Mike Scalzi just prefers to deliver solid slabs of very non-typical hybrid of power, thrash and classic heavy metal. Atavism has got that rugged no-polish feel and a ton of substance which can sustain many a listen. If there was a flagship song I wanted modern power metal (not Euro-helium heads) bands to examine it would be I Will Kill You/You Will Die. Barbed galloping riff’n’roll, polyrhythmic structures, multiple leads and excellent vocal harmonies. Slough Feg does not stop at one standout track and does not squeeze all songs within the same style. Hiberno-Latin Invasion is an epic song with the main riff having Celtic origin and schizoid quality. Eumaeus the Swineherd exudes the trademark Black Sabbath heaviness, while Agnostic Grunt has a fundamental Deep Purple feel with Starport Blues continuing in the same vein only as if the band does it in a live setting with vocals behind in the mix and jazzy spontaneous jam leads. Over all this power and naturalness Mike Scalzi delivers his vocals, lacking polish and huge on manliness, almost a perfect match for Slough Feg robust music delivery. With all the ruggedness, however, don’t think for a second the band is devoid of deep emotional responses. Electroacoustic guitar sounding like a downtuned harp in the title track, dark and brooding Curse of Athena with Adrian Maestas’ bass runs peel the skin off my back where hair was already standing on end. Slough Feg is not afraid to experiment, both with songwriting and song sequencing putting instrumental progressive gallops in the places you least expect them. A couple of softer rock (Man Out of Time) and rumbling (Agony Slalom) tracks toward the end lose me, but overall I am in awe. It is so difficult to keep the flag initially unfurled by Iron Maiden when the originators themselves are hard at trying to fold it in. 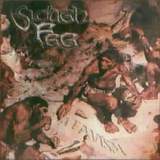 Slough Feg, all the while not anybody’s copycats, keep the flame burning strong. Atavism, with its rough’n’raw production, is so good it made me do something I haven’t done in a long time – for the whole week listen to almost nothing but all those classic and less so 80s rooted bands such as Cirith Ungol, Manilla Road, Liege Lord, Twisted Tower Dire, Cauldron Born, etc. Cruz del Sur scored a coup with Slough Feg and they should be proud of it.